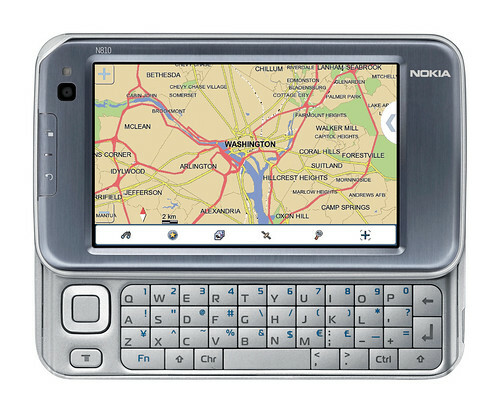 Posted on October 17, 2007 by Michel S.
New: Now with GPS, spacious internal storage, and sliding keyboard built-in! So commercial software providers (Skype, Real Networks) will provide Linux ports if they judge that the userbase is big enough. Which is good news. The same thing applies to Nokia itself, naturally, and sadly in this case, they do not think there is demand for Ogg Vorbis playback. All the software for the new device (minus GPS — though perhaps it’s the same software that comes with the GPS kit for N800? Oh, and the ambient light sensor) will run on the N800, so holding back won’t be that painful. Spent last night getting a crash course in using OCaml to do non-functional things (hash tables, file I/O, regular expressions) and the result is now up. The JoCaml version does the file-partitioning trick used in the C++ implementation, with each finder workers being run inside a JoCaml channel; the channels share a single lock so they can update the hash table serially. Interestingly, current implementation does not get a speed-up from the input file being cached (Ilmari’s wf.ml does). Will have to peruse his to see what’s slowing things down. Lesson: not all techniques for processing a file line-wise are equally good! Posted on October 16, 2007 by Michel S.
Boost regular expression is not compiled? First point can be ruled out: Boost compiles regular expressions when you assign them. Second point — well, reading in the file using std::getline turns out to consume the bulk of time. I’ve reorganized the code a bit, using a multimap rather than a vector to rank the URLs by count, with no effect on speed. With two and four threads on a dual-core Intel notebook, the performance is at least on par with Ruby. Alastair Rankine has a C++ implementation that is slightly faster, but uses Boost memory-mapped IO that I avoided for the same reason he put as caveat: that it will not scale to files that are too large. Which Tim’s log file might well be. Again, that is not significantly faster than the Ruby code. Moral of the question: Perl and Ruby can be faster than C++! The C implementations out there are blindingly fast, but the way they do regular expression handling are really painful. Will turn my (limited) spare time to doing a clean JoCaml implementation — it might not be faster but it definitely will look cleaner! Posted on October 15, 2007 by Michel S.
After turning in the C/C++ monster (cleanest C code I reckon it is possible to write, thus the total lack of memory-mapped I/O and other optimizations), I turned my attention to picking a better implementation language. As it turns out, JoCaml fits the bill perfectly. It’s an extension of Ocaml, so it combines a rich library with a familiar syntax (not to me, but having used both Scheme and Haskell, how different can it be) — and a very nice process calculus! Note that the echo channel will block, since pop can’t return a value until the stack contains something! This value is then pushed into the stack and ‘1’ printed. More of this at the JoCaml site. And, as it turns out, there already is a JoCaml implementation of the Wide Finder, by Ilmari Heikkinen. Will have to grok the finer details from him. Posted on October 12, 2007 by Michel S.
Several weeks ago, Tim Bray posted his Wide Finder project: take the Ruby script that parses an Apache log file and report the top 10 hits, and parallelize it in your language of choice. It occurred to me a while back that this is a perfect job for a C multi-process program, taking advantage of Linux’s cheap copy-on-write fork, if not for the need to merge the result. So it would probably be easier to write it using the pthreads library instead. One would want to reduce inter-thread communication as much as possible, though. The input file can be partitioned cleanly into multiple chunks of roughly identical sizes without communication, as long as each thread follows the same protocol. i.e. a common chunk size is used, and all but the first thread needs to check if the character before their starting offset is the end-of-line. If not, they need to skip until the end of line, yielding that line to the previous thread. With two threads, though, it runs faster, almost at Ruby speed. So, as Tim observed, the problem is not entirely IO-bound. More testing is needed, but will probably need to be done on a machine with faster IO (and more CPUs). Like Tim’s new Niagara T2 testbed. Will edit this post later — need to run now, and wanted to get this out as soon as possible. Code is available here… now I just need to find Tim’s email, since his blog is down. Argh! Update: switched to the new std::tr1::unsorted_map. Performance seems identical with a single thread, but slightly higher (within margin of error) on two threads — which makes sense: a multithreaded run exercises the map more, because each thread’s map has to be merged into the final map.